In walkable Key West you can visit historic homes and forts, experience the spectacular undersea world of coral reefs, soar above the water on a parasail, browse in small shops for unusual trinkets and treasures, savor tempting dishes in casual restaurants, and enjoy live music in quirky bars where no one is a stranger. Experience it all with good shore excursion choices. 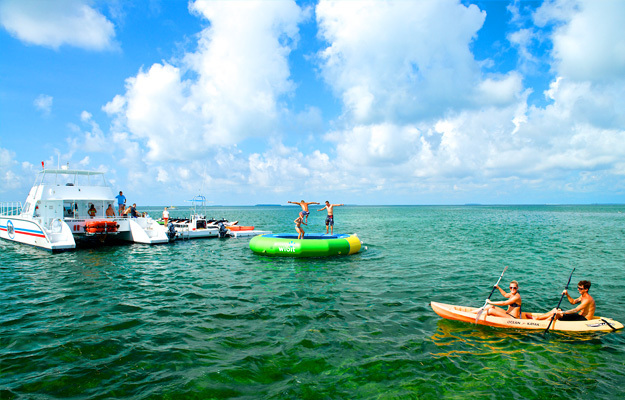 Favorite Key West shore excursions take place off shore! All depart within easy walking distance of cruise ship piers. Excursion times range from 12-14 minutes to 3 hours. All you need is a swimsuit, towel, sunblock and camera. The equipment and fun are provided. Dolphin Watch & Snorkel Combo. Cruise the waters around Key West aboard a fast catamaran in search of bottlenose dolphin. Then sail into the calm, crystal-clear waters of the Gulf of Mexico backcountry for an hour of snorkeling to experience marine life living in the shallow waters. The 2.5 hour tours depart at 9am, 12:30am and 5pm. Ultimate Jet Ski Tour. Spend 1.5 super-fun hours on a 28-mile scenic jet ski ride around the island. Zipping around Key West’s Atlantic and Gulf coastlines is a great way to see the island from a different perspective and be on the water at the same time. Venturing out into the pristine, mangrove-laced backcountry is a unique experience. Age restrictions and rules apply. Key West Single Parasailing or Key West Tandem Parasailing. Soar high above the aquamarine waters on a thrilling 10-12 minute parasail ride. Walk over to the interesting Historic Seaport to hop on Sebago’s fast boat departing every hour on the hour from 9am to 4pm to head out for the thrill ride of a lifetime. Fly solo or in tandem with your BFF! Age restrictions apply. Key West Eco Kayak Trip. Take a laid back kayak paddle through mangrove tunnels and over the clear backcountry flats. Come upon wading birds and sea life swimming by. Glide over sea fans, sponges and even an occasional small bonnet head shark. The adventure begins on Geiger Key, a few miles out of Key West. To get there, arrange for their free shuttle bus service. Tours depart 9am, 11am, 1pm, 3pm. Morning Reef Snorkel or Key West Snorkel & Sailing Adventure. Head out on a short boat ride into the shallow reefs around Key West to snorkel along the only live coastal barrier reef in the Continental United States. See colorful reef fish, grouper, eels, amazing coral formations and occasional nurse sharks cruising by. Both excursions are similar. 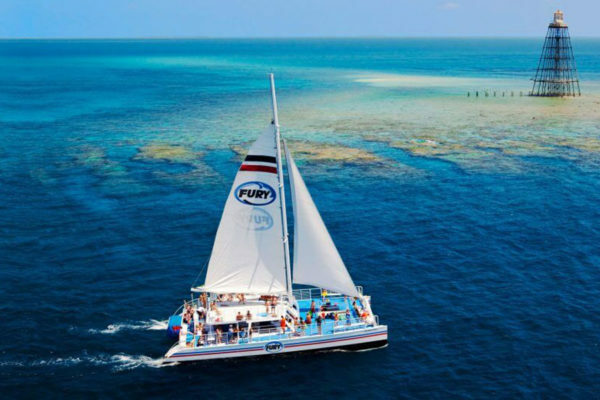 Fury’s Morning Reef Snorkel is 3 hours and departs at 9:30am; Sebago’s eco-tour reef snorkel is 3.5 hours and departs daily at 9am and 1pm. Glass-bottom Boat Day Cruise. You don’t have to get wet to see the undersea world. Spend 2 hours skimming over the water watching for fish sightings from spacious decks or see them underwater through large glass viewing areas below decks. Departing from the pier a 0 Duval Street at noon and 2pm, the excursion is a comfortable ride aboard a 65-foot catamaran with plenty of space to chill. There is an onboard snack bar, but if you want more, you can bring your own food and drinks including alcoholic beverages. The museums of Key West are as small and eclectic as the island itself. Each is Key West-centric, reflecting the island’s colorful history. 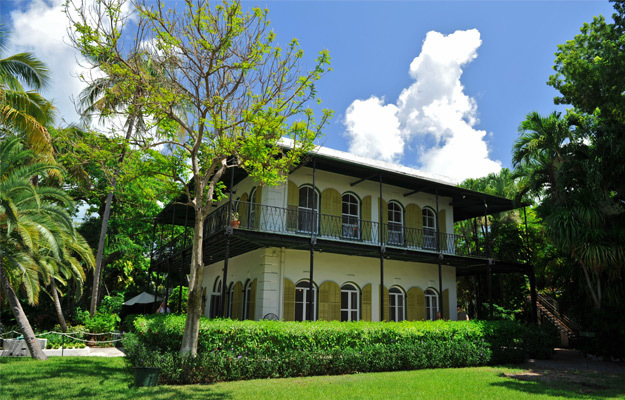 House museums such as the Ernest Hemingway Home and Truman Little White House are important as historic buildings which have taken on the legendary status of their famous residents. The Customs House, East Martello Museum, Mel Fisher Museum, Lighthouse Museum are important historical structures in their own right, housing small, unusual collections. Ernest Hemingway Home & Museum. Notable literary giant Ernest Hemingway found Key West to be a place where he could write, fish, and enjoy the friendship of locals. The building which was his home from 1931 t0 1940 is a Spanish Colonial built in 1851. The house is much as it was when Hemingway lived there with his 2nd wife, Pauline, and their two sons. The interior is furnished with pieces from Pauline’s collection brought from Paris where the couple met. Also on exhibit are some Hemingway memorabilia, much of it in the studio where he did his early morning writing. The large number of six-toed cats roaming the house and grounds, most of which are descendants of the cats the Hemingways kept while living there, are a favorite photo op. Harry S. Truman Little White House. The large frame house built in 1890 by the US Navy to house officers, has had multiple lives. It is best known as the “Little White House,” where President Harry Truman spent eleven working vacations between 1946 and 1952. The simple and utilitarian house on the quiet island suited the plain-spoken president from Missouri. Daily guided tours through all the rooms, faithfully restored as they were during Truman’s visits, are filled with stories and anecdotes of presidential visits and items of interest. Small exhibit rooms display photographs of an impressive list of national and international dignitaries who visited or stayed at the Little White House from the Truman to today. These photos document the important legacy of this simple house as a gathering place of international leaders. Shipwreck Treasure Museum. This unusual museum is an immersed into the “wrecking” era of Key West of the 1850s, a story unfamiliar to most people. It was a time before lighthouses marked the location of America’s only living coastal reef within just a few miles along the length of the Florida Keys. Navigating in the dark of night or during bad storms without the guidance of the silent sentinels, many cargo-filled sailing vessels met their demise on the treacherous reef. In Key West, an entire industry, “wrecking,” as it was called, was created out of the business of rescuing crew and passengers and salvaging cargo. Hear colorful tales and see artifacts rescued from the sea. Climb the 80’ wreckers’ tower for a fabulous panoramic island view, including a great view of your cruise ship anchored nearby. Key West Butterfly & Nature Conservatory. Slip into a magical world where butterflies of every imaginable color and tiny birds fly freely throughout lush tropical foliage and flowering plants in the glass-covered conservatory. Walk slowly along the path. If a butterfly lands on you, luck will surely come your way!